The proxy is used to capture TCP/IP packets exchanged by test participants. The packages flow is analyzed and stored in a database for further analysis by protocol specific analysers. Filter panel is collapsable, to provide more space for grid. The proxy allows to capture HTTP messages sent over a TLS channel. However, as we are not yet able to decode encrypted frames (like in a man in the middle attack), the proxy acts as a TLS server and a TLS client. Decoding of the frame is planned for a future release. If the proxy has to be used transparently, clients and servers should not check for the mapping between the ip and the certificate (server : DN = TCP qualified name, client : validation of certificate based on IP). When a TLS channel is created, a PKCS12 (.p12) file MUST be provided for the TLS server socket. The p12 should contain a private key and certificates. The .p12 MUST be protected by a password, provided in the matching form input. The server p12 should mimic the real server certificates, as clients could validate the TLS channel against a truststore. Also, the proxy supports TLS authentication. When a client connects to the proxy, it first connects to the real server without using any certificate. When the TLS channel is open, data from client is forwarded to the server. The server then can ask a renegotiation to the proxy for authentication. The key used is then the p12 provided for client. At the moment, if the proxy failed to authenticate on server, the source connection is closed without the source error transmitted. Proxy acts as a network relay between two SUTs. As a result, system configuration has to be modified. The TCP connection must be established on the proxy on the system configuration's proxy port instead of opening a connection to the responder SUT directly. 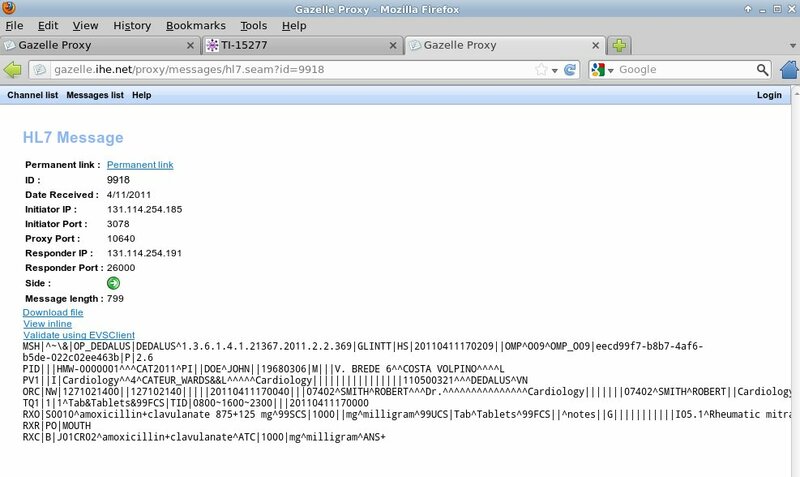 By accessing proxy directly using http://gazelle.ihe.net/proxy, messages can be filtered on different criterias. By clicking a value in the table, it either opens the message details for id column, or set the filter for other columns. startAllChannels : It takes "List<Configuration> configurations" in argument. 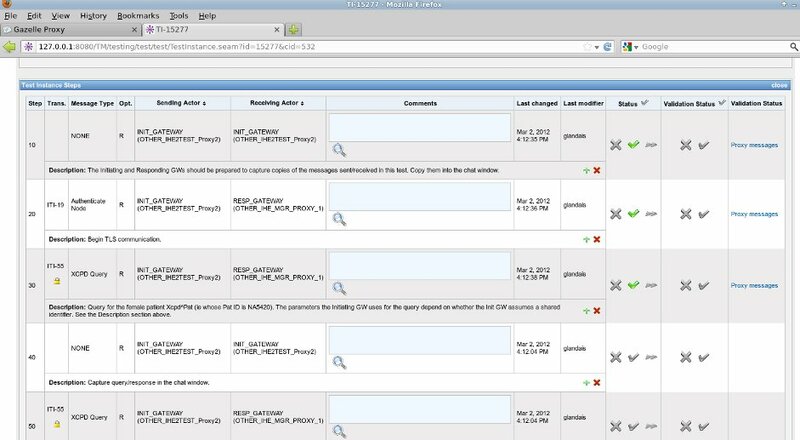 It start a new channel in proxy for each configuration set. startTestInstance : It takes "TestInstance testInstance" in argument. 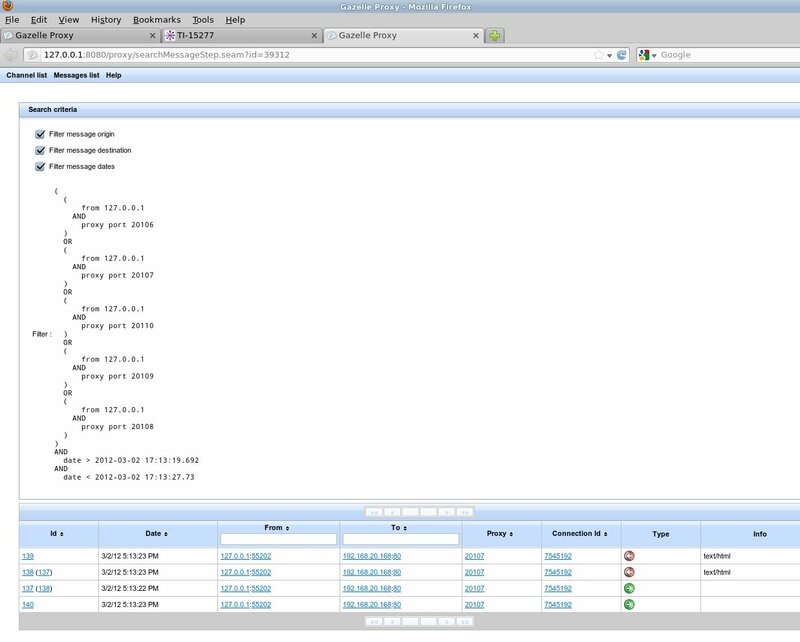 It start a new channel in proxy for a test instance. markTestStep : It takes "int testStepId" in argument. It set the date of a test step with the current.